Go Snowmobiling with the Latest NY State TRAIL MAPS !! Ride more than 10,500 miles of Upstate NY Snowmobile Trails during the Winter Months. While Upstate New York provides winter fun for every genre, snowmobiling is probably one of, if not the, most popular. And we have the trails to prove it! Did you know that there are more than 10,500 miles in the Statewide Snowmobile Trail System? These trails traverse 45 counties, are maintained by more than 200 clubs and are funded through 51 municipal sponsors. Check out the comprehensive NY State Snowmobile Trails Map and find additional Snowmobiling information on the website. This vast trail network is comprised of lands under the jurisdiction of OPRHP (Office of Parks, Recreation and Historic Preservation), the New York State Department of Environmental Conservation (DEC), NYS Canal Corporation, national forest land, local governments and many private landowners who have increasingly opened their property to snowmobiling with insurance coverage provided by the state snowmobile program. Cousult the at the New York State Snowmobile Association for more info. 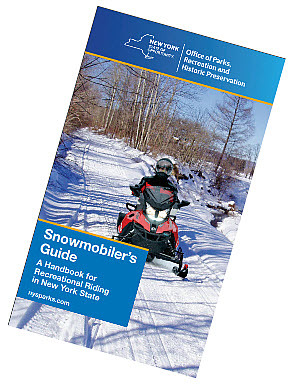 > View and Download a FREE COPY of the NY State Snowmobilers' Recreational Guide. Please note that any snowmobile operated in New York State must be registered with the New York State Department of Motor Vehicles (DMV), even if it is registered in another state or province, except under certain special circumstances. Snowmobilers must carry registration and proof of insurance documents on their person, not the snowmobile, at all times while snowmobiling.